Kochale, A.; Ruiz-Hidalgo, J.; Borsum, M.
The demonstration described hereafter covers technical work carried out in the FascinatE project , related to the interactive retrieval and rendering of high-resolution panoramic scenes. The scenes have been captured by a special panoramic camera (the OMNICAM)  with is capturing high resolution video featuring a wide angle (180 degrees) field of view. Users can access the content by interacting based on a novel device-less and markerless gesture-based system that allows them to interact as naturally as possible, permitting the user to control the rendering of the scene by zooming, panning or framing through the panoramic scene The demonstration described hereafter covers technical work carried out in the FascinatE project , related to the interactive retrieval and rendering of high-resolution panoramic scenes. The scenes have been captured by a special panoramic camera (the OMNICAM)  with is capturing high resolution video featuring a wide angle (180 degrees) field of view. Users can access the content by interacting based on a novel device-less and markerless gesture-based system that allows them to interact as naturally as possible, permitting the user to control the rendering of the scene by zooming, panning or framing through the panoramic scene. 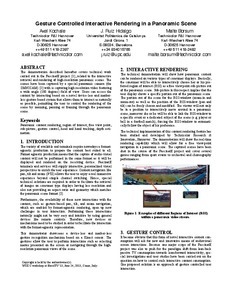 Kochale, A.; Ruiz, J.; Borsum, M. Gesture controlled interactive rendering in a panoramic scene. A: European Interactive TV Conference. "EuroITV 2013: 11th European interactive TV conference: adjunct proceedings: June 24th-26th, 2013: Como, Italy". Como: Politecnico di Milano, 2013, p. 188-189.